EOS International offers simple solutions to end poverty in Nicaragua through the use of sustainable technologies. Since its founding in 2008, the company has installed 1,772 technologies that have changed the lives of 354,000 Nicaraguans by either improving their health, generating income, or providing access to clean energy. Out of all the technologies installed across the country, 247 are solar systems that provide reliable electricity to families living in remote areas. Without these systems, families are forced to burn kerosene which leads to smoke inhalation and CO2 release into the atmosphere. 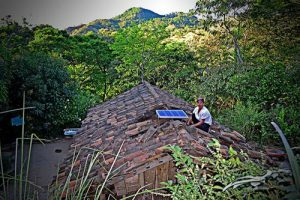 These systems provide each household five hours of clean electricity and the ability to enjoy simple activities such as studying and reading without being at risk of inhaling smoke.